The 2017 Hyundai Elantra arrives at dealerships this month and Hyundai wanted to offer auto industry reporters some hands-on time with the redesigned Elantra during a press event and chose Imperial Beach for their launch. 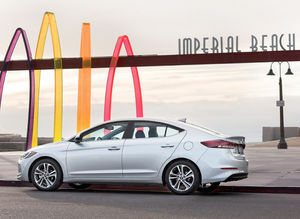 “When we first embarked on planning the 2017 Elantra program, we looked at more than ten venues around the country before selecting Imperial Beach. Your beautiful city with its stunning sunsets, gorgeous beach and peaceful atmosphere immediately draws visitors to its attractive and simple modern lifestyle. This unique combination of the city’s attributes and community values, as well as the host hotel selected, Pier South Resort, matched perfectly with the next generation Elantra, Hyundai’s best selling and award-winning car in the United States. “The greater San Diego area has some of the most amazing roads and highways with majestic natural beauty serving as the perfect backdrop for photos and filming, another major ingredient needed to successfully launch a ride-and-drive program that helps provide participants with the content they need in addition to test driving the Elantra. Blessed with year-round great weather, Imperial Beach and the greater San Diego area provided the right environment that make it possible to hold an automotive launch program during the winter season. Our host hotel sitting right on the ocean provided the perfect setting to greet over 100 national automotive journalists, bloggers and social media influences arriving from every corner of the country to test drive the 2017 Hyundai Elantra. “Imperial Beach has a great sense of community with friendly and welcoming residents. Privileged to spend some time in this city for over a week and a few visits before the program provided me the opportunity to interact with several local residents that are now friends. The fun interaction our team members had with hotel staff, local merchants we did business with and the many residents that curiously walked by and spoke to us, were just wonderful experiences. Many had great things to say about our new Elantra. We just might make some local dealers very happy once they arrive next month!